Join allassignmenthelp.com referral program and share the sign up links with your peers, you stand a great chance of referral converts. 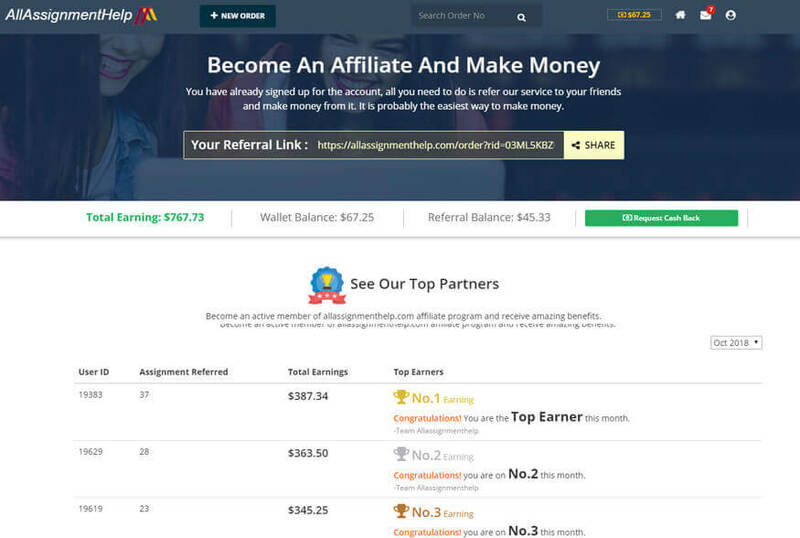 Becoming an academic affiliate with allassignmenthelp.com opens unparalleled earning opportunities for you. Our processes are simple and user friendly. You only need to sign up and become an affiliate partner for allassignmenthelp.com. No sign up cost required. You can request affiliate earnings through a single click of button through PayPal. Monthly Payments. You can invite referrals through social media, phone and email. You can track all referrals easily. If Your friend places an order for $100, you get $10 flat. In case your friend again places an order for $100, you get $10 again. You can generate easy reports and request them over email on monthly basis. We take care of our partners in every possible way. Marketers all over the world are looking for a marketing solution like Instapage to increase their conversions and return on their ad spend. Profit by being the one to share Instapage with them. Students are earning more than $2000 per month by doing no further efforts, Why are you missing out? We have a clean and easy to navigate dashboard to track your leads, earnings and potential ways of churning more clients through referral. We provide a dedicated affiliate manager to answer all your queries regarding affiliate program. Sign up and find out your manager details. Our dashboard is enriched with ideas about increasing conversion rate, sending reminders to your referrals. Try the most powerful referral program which is very simple. You just have the right platform to convert your contacts into money with a single click. Sign up to explore our features. Questions? Click here to find out more on our FAQ page. I have been working with allassignmenthelp.com for around three years now. I got lots of assessment done and got great scores too. Hence, I contacted my peers who had issues with assessments due to time limitations and other reasons. I was sure about the quality and on top of it, I started making a good amount of money as well. I have seen the referral system has changed manifolds in the last 2 years and it is really good now. I can make around 15% commissions since I am able to generate more leads for the company. It has become easier for me to have some spare money for myself without investing any efforts in the deliveries. There has never been a great system that helps you make money. The best part is I can adjust my money for my assignments as well. I am so happy to be an affiliate with the team. Locate the referral discount link in your account in the section Referral Program. How many times will the link work? The referral link will work one time. However, all the future orders can get a 5%, 10% or 15% discount. Read more about our discount policy on this page. Both my friend and I will be able to use the discount link, right? It's only your friend who can enter the discount link in the order form. Please note, however, that we offer one time and lifetime discounts, which you are welcome to benefit from. See the full list here. What is the money withdrawal procedure? In order to withdraw your earnings, you will need to send a request to enquiry@allassignmenthelp.com before the 12th of every month. Please note you can only withdraw $100 or more. The money will come between the 16th and the 20th. What are the supported payment systems? We support Skrill, PayPal and Webmoney.